Event ID 4724 will be logged in Domain Controller whenever we reset an user's password. In this article, I am going to explain about the Active Directory password reset audit Event ID 4724, how to enable or configure Event ID 4724 through Default Domain Controller Policy GPO and Auditpol.exe. This sample 4724 event info logged while reset the user Smith's password. here, the Subject field indicates 'Who' reset the password and Target Account indicates which user account's password reset. 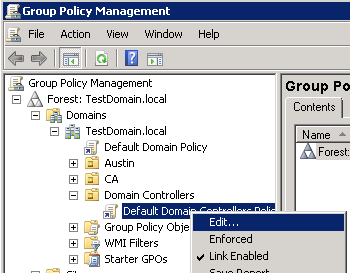 To enable event id 4724 in every Domain Controller, We need to configure audit policy settings in Default Domain Controllers Policy, or you can create new GPO and links it to Domain Controllers OU via GPMC console, or else you can configure the corresponding audit policy on Local Security Policy of each and every Domain Controller.. Follow the below steps to enable AD password reset audit event 4724 via Default Domain Controllers Policy. 4. 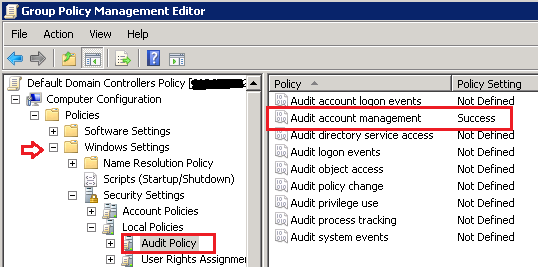 Expand Computer Configuration node, go to the node Audit Policy (Computer Configuration->Policies->Windows Settings->Security Settings->Local Policies->Audit Policy). 5. Navigate to the right side pane, select the policy Audit account management, and set the success audit value. 6. Update/Refresh GPO settings by running the command gpupdate/force. You can disable or stop Active Directory password reset audit event (Event ID 4724) by removing success audit in User Account Management subcategory by using the following command.